The City of San Luis Obispo has another month full of press coverage and we couldn’t be more pleased. With a feature in LA Times and a ranking on Gallup and Sharecare’s Well-Being Index, it’s time to catch up on SLO’s latest coverage from September 2017. With ocean views and sunny skies, accompanied by historic stations and lively cities, it’s no wonder why the LA Times wrote a feature about this one-of-a-kind trip to San Luis Obispo. If you find yourself hopping off Amtrak in San Luis Obispo, we highly recommend staying a night or two to explore the city, which is easily accessible when travelling car free. Stroll through the bustling blocks of Downtown San Luis Obispo and make a pitstop at Bubblegum Alley or enjoy a flight at one of the local craft breweries. Start planning your sustainable trip to SLO today. Calling all fitness fanatics and exercise enthusiasts! San Luis Obispo ranked #3 in Gallup and Sharecare’s rankings of communities with the highest rates of regular exercise in the United States. San Luis Obispo continues to be an active and friendly community, offering its own bike boulevard, multiple biking and running paths, and a plethora of local gyms and studios. 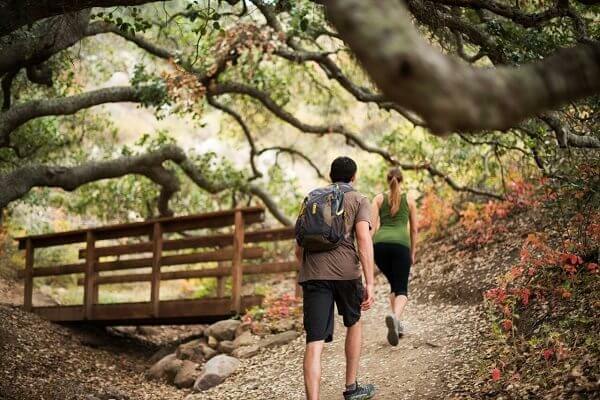 Not only that, but SLO also boasts a variety of hiking trails and nearby beaches along the Central Coast, helping visitors and locals stay active all year-round. Spoiler alert… you’re about to get the inside scoop on Alaska Airline’s Wine Flies Free program. A recent publication from CheatSheet has helped spread the word that Alaska Airlines Mileage Plan members can fly a case of wine home with them for free when departing from the San Luis Obispo Regional Airport. Now, if that’s not inspiration I don’t know what is! If you find yourself in the area, take advantage of this sweet deal and take home a case of wine from your favorite San Luis Obispo winery, or create a collection from a variety of wineries. You’ll get to sip your way through Edna Valley and then, take a piece of SLO home with you. Begin planning your wine tasting adventure today.